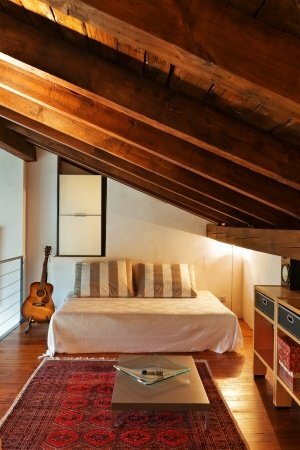 Loft spaces can be awkward to try and make them work as added space within a home. Find out how this loft doubles as two extra spaces, combined into one, while looking great at the same time! This particular loft is an extra bedroom for guest, as well as a media space. Placing the bed at the end of the room tucks it away and gives a sense of privacy. The flat screen is mounted on the wall at the other end of the room. A husband or a wife can come up here to have some quiet time and watch their favorite shows. There is the added plus of possibly taking a cat nap on the comfortable bed! Combining a media space and a bedroom is a great way to get lots of use out of the long narrow room. There are stairs, not a ladder, which leads up to the loft space. The key to having a loft that you actually use is having stairs to access it. A ladder makes it not as appealing to just go up and hang out in a loft. Actually ladders deter people from using their loft space. A successful loft will have access by stairs. If you are intending on using a loft space, make sure to give it a chance by having easy access. Make the loft a comfortable area that family members and guest will actually want to use the space. Comfortable floors and furniture is a must. 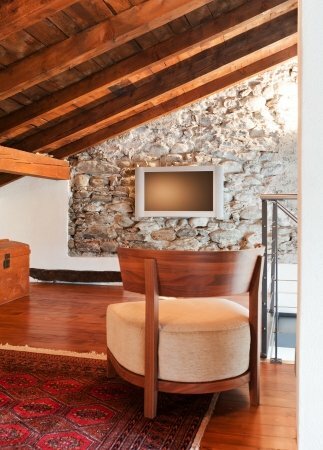 In this loft the wood beams and the stacked stone on the walls make the space feel warm and inviting. A brightly covered area rug makes the floor feel welcoming. There is even added storage up against the wall that has a very low ceiling height. Most loft spaces are in the part of the house where the walls meet the pitched roof. Utilize this awkward space by having low furniture or cabinets that can be used for extra storage. Guest can also use this storage space to keep their belongings and clothes in, while staying in the loft! This entry was posted in Interior Finishes by creatingyourspace. Bookmark the permalink.